The following summarises the differences and relative merits between laser scanning and 3D reconstruction from photographs in the context of recording in archaeology. It is intended to be an informal discussion targeting a commonly asked question, namely, "Should I use a laser scanner or use 3D reconstruction (often referred to as photogrammetric techniques) to capture a 3D model of X"? 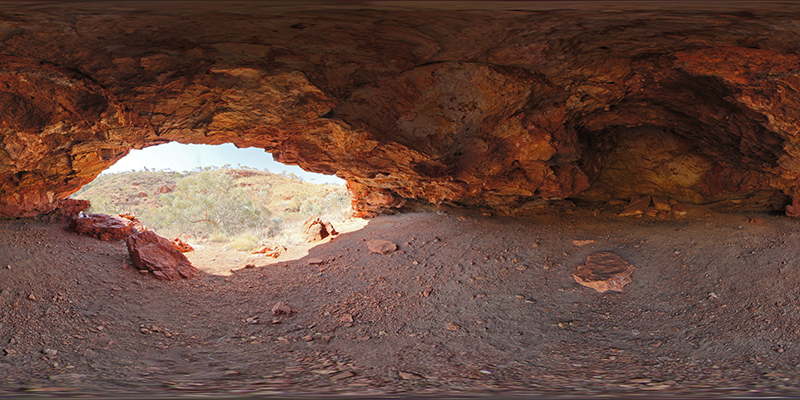 The relative merits will be illustrated by an example that employed both laser scanning and 3D reconstruction to capture a model of a rock shelter used by indigenous Australians. An attempt is made to cover all possible considerations to assist anyone contemplating which of these digital recording technologies to use. It should be noted that the author is a practitioner of the 3D reconstruction approach. But an effort will be made to present the comparison fairly, noting again that it is based upon an actual recording of the same site with both technologies, as such a direct comparison can be made. Also noted that as with any report comparing technologies, it can become out of date as newer products and algorithms become available. The rock shelter is located in a region known as West Angeles in Western Australia. It is approximately 50m long, 20m deep and between 1.6 and 3m high. 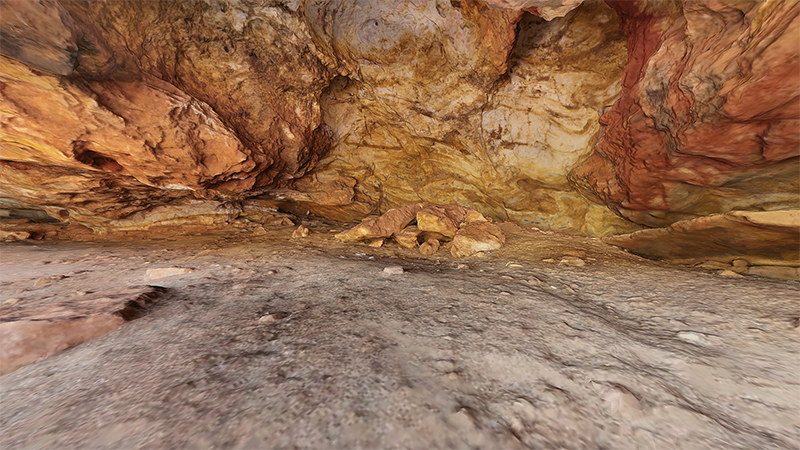 An interactive 360x180 panorama of the site can be experienced below. Figure 1: Interactive photographic bubble from inside the rock shelter. The Laser scanner used was a Leica C10 (green light, 532nm). 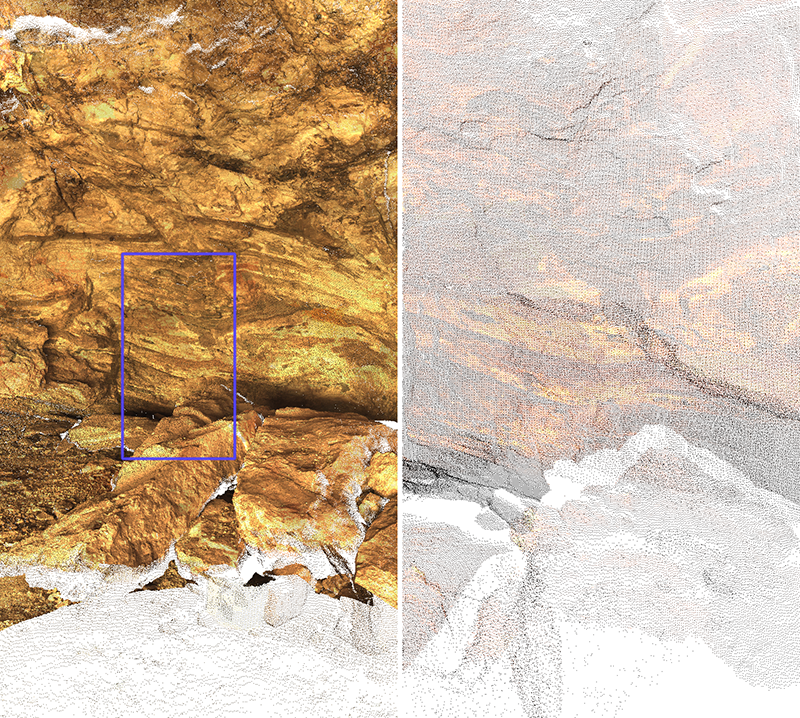 In order to minimise the occlusion zones due the highly convoluted nature of the rock shelter, 6 scans were acquired, each from a different location. The position of the reference markers were geo-referenced with a kinematic GPS observation. Post processing was performed with the Leica Cyclone software. The scan resulted in just under 110 million points with about 80 million of the shelter itself and close environs. The photography for the 3D reconstruction was a Canon 5D Mk III, a 20+MPixel full frame camera, and a 28mm prime lens. The software to perform the reconstruction consisted of a commercial package called PhotoScan as well as a pipeline developed by the author. While one or the other of these two software solutions can perform better than the other in some circumstances, for this model the results were largely the same. Due to the convoluted nature of the cave, almost 2000 photographs were taken. Ss per the norm for this process, each photograph is taken from a different position. The choice for the reconstruction was a 2 million triangle mesh, this was in order for it to be conveniently used within real-time navigable experiences. A 5 million triangle mesh was created for archive purposes. In both cases the textures were created as four 4K images. There is little question that laser scanners are more accurate. Depending on the model they are reliably rated with a known maximum error. Depending on the exact scanner and configuration it may be in the mm range or even less. When discussing accuracy in this context, it only applies to parts of the model visible from the laser scanner, how does one rate the infinitely inaccurate nature of parts of the model not visible. For highly convoluted objects such as the example used here, a potentially large number laser station locations are required. Even though 6 locations were employed in this example there are many occlusion zones. The following shows a view of the point cloud from the position of one of the laser scanners (left), the middle and right image are views from different positions showing parts of the model not visible from any of the laser positions. Figure 4: Illustration of occlusion zones (middle and right) when viewing from positions not visible to any laser station position. 3D reconstruction, performed optimally, has a different camera location for every photograph resulting in far fewer occlusion regions. However in 3D reconstructed models the error is more variable, more dependent on the size of the object and the number of photographs taken and the skill of the photographer (see later). 3D reconstruction can result in global scale and distortion errors, that is, distortion at the scale of the whole object. Such scale and distortion issues can be addressed with more rigorous techniques including geolocated reference markers or known dimensioned lengths. This was not performed here due to the negative impact on other desirable features of 3D reconstruction, namely capture speed and equipment constraints. Texture quality of 3D reconstructed surfaces is accepted as superior to laser scanners. In the former it is dependent on the resolution of the camera and the size of the patches being photographed. The quality of the textures is also dependent on the skill of the photographer, whereas for a laser scan it is more consistent. Errors in the texture on the resulting mesh can occur, these are generally introduced by the reprojection stage of the algorithm where the photographs from the cameras and the need to blend the chosen parts of the photographs across the 3D mesh. This is similar to the errors arising from warp and blending in panoramic photography. For laser scanning the colour resolution is per point. Generally the camera for a laser scanner is offset from the scan beam so errors due to parallax can occur. Comparing how the two techniques perform in different lighting conditions is more difficult and depends on the laser scanner being used. For pitch black spaces a laser scanner will function with fewer issues, whereas photographs would be problematic especially if hand held which the author maintains is important for the time required to capture. By comparison laser scanners generally have more issues with strongly lit spaces such as direct sunlight, while photography benefits from this by employing small apertures and improved depth of focus. In both cases the variations in lighting affects the colour of the final result, this is usually more marked in the case of 3D reconstruction. Both techniques suffer from certain material types. 3D reconstruction fails with reflective surfaces since the feature point stage will identify features within reflections with the result being an incorrect depth calculation. This is doubly problematic for curved reflective surfaces where feature point depths diverge. Laser scanning suffers from reflective surfaces as well but problems will arise earlier with 3D reconstruction. Both techniques can have issues with very dark (light absorbing) surfaces, the laser scanner not getting a return signal and in the case of 3D reconstructions no feature points may detected between photographs. A key difference between the two techniques is the data type they deliver. In one case a cloud of coloured points (x,y,z,r,g,b), in the other a textured mesh surface. While the point cloud from a laser scan can still be converted into a mesh, the problem is more difficult than deriving a mesh during the 3D reconstruction process due to less information being available. The texture of the mesh would also be inferior due to the per point nature of the colour information. There are a number of applications for which a textured surface mesh is more useful, or even required. These include the use of the 3D model in 3D rendering pipelines or as interactive virtual reality environments. Not only are textured meshes more readily supported, they also have the advantage of not becoming "thinner" as one approaches. 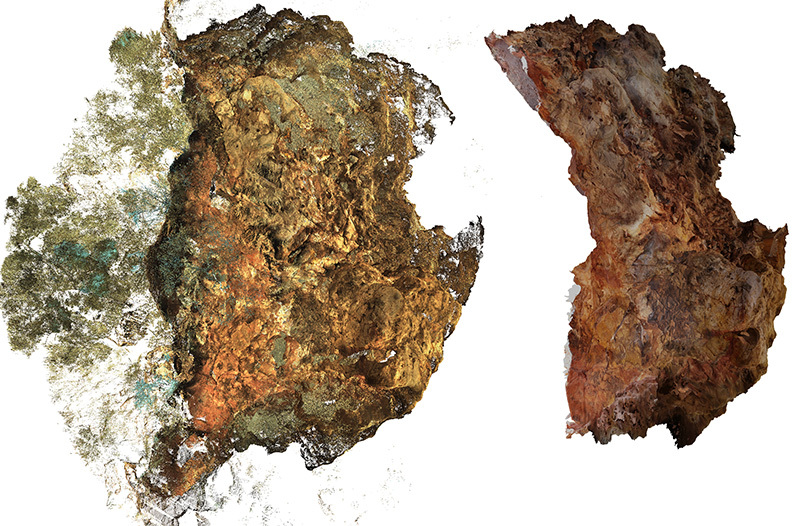 Coloured point clouds can appear solid when they are sufficiently far away in comparison to the screen resolution. Or when they are suitably dense, but this raises issues of the volume of data and how efficiently the surface is being represented. For example, the 110 million points here would not normally be considered a particularly dense laser scan but interactive navigation in such a point cloud is a significantly higher graphics load than a 2 million triangle mesh, the later having considerably more visual appeal. Figure 5: Illustration of point thinning when moving closer to, or zooming into a point cloud. Zooming into a textured mesh from 3D reconstruction results in the usual image blurred appearance that occurs when zooming into any image when an image pixel starts to span more than one display pixel. 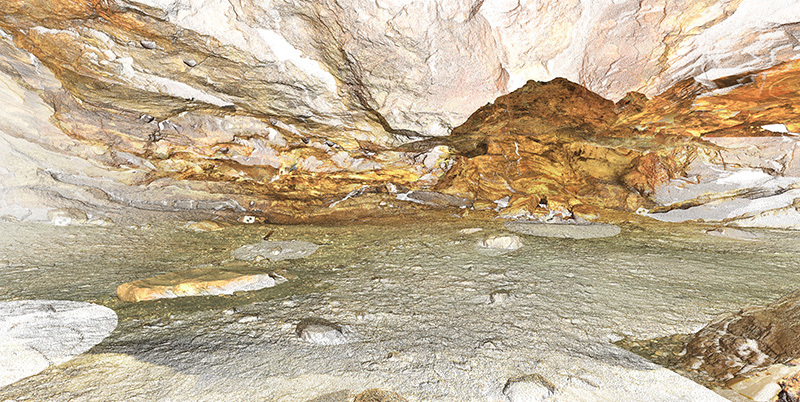 An advantage of laser scans is that they will generally capture more of the scene than required. The photography for 3D reconstruction is more targeted on the subject matter in question. In the example here and shown below, trees and a broader area in front of the shelter are recorded. While the trees are not true 3D objects, they do however form part of the context of the site. Note that in the figure below the point cloud has been cropped, some even more distant objects have been recorded. Both technologies struggle to handle foreground, isolated occluders, in this case say a tree trunk in the entrance to the shelters. Laser scanning would require a number of laser scan positions around the occluder to capture the shape on all sides. For 3D reconstruction the limit relates more to the algorithms and their ability to create feature points connecting the occluder to the rest of the scene. A good SLR camera and prime lens suited to 3D reconstruction cost significantly less than a laser scanner. 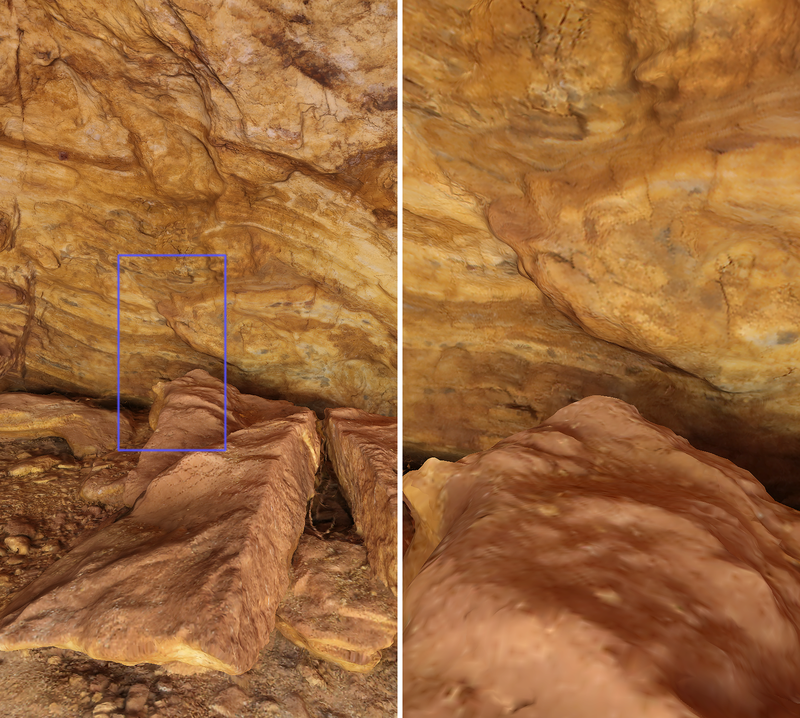 In the example here, in order to achieve coverage for the convoluted shape of the rock shelter, 6 scans were performed from positions aimed at minimising blind spots. Photography took less than 30 minutes, each laser scan position took around 1 hour once the set-up and calibration time is included. In short, 30 minutes compared to a day. The post processing times are comparable between the two techniques, they can both be significant. Heaviness of laser scanners and associated hardware (heavy tripods, batteries) for remote deployment, especially across rough terrain, can be quite challenging. 3D reconstruction only requires a single SLR camera and a modest lens, or two. Tripods for photography for 3D reconstruction are rarely used except in light challenged environments and were not required in this example despite the subject matter having a strong lighting variation from direct sunlight to shadow within the shelter. Both techniques are considered non-invasive. They both require a human operator in the space, laser scanning additionally requires a tripod. There may be cases where the laser beam may damage the surface being captured but that is rare and certainly not a consideration in the example here. There is a consideration of safety of the laser beam with humans in close proximity. Equally for 3D reconstructions one does not want people moving within the space. Both techniques can handle a degree of movement in the environment provided it isn't either in the current scan direction or in the area currently being photographed. A laser scanner is usually performed by someone who has completed a course on the correct operation. By contrast, the casualness and lack of specialist hardware with which 3D reconstruction can be attempted means that often the photography is not performed optimally. There are very few courses where one learns the techniques, and like other areas of photography there is a skill involved that is acquired through practice. For example, two photographically acquired models by different operators will show much more variation in quality than model acquired by two different laser scan operators. The non-specialist aspect of 3D reconstruction may be considered an advantage but one consequence is that often poor photographic technique is employed. This not only results in non-optimal 3D models but can also bias the comparison to laser scanning. Putting aside environments or surfaces where one or the other capture technology may fail, the photographic based 3D reconstruction has many advantages. In the authors opinion the deciding factor is the intended purpose of the 3D model. If the intent is a 3D model for real-time experiences or giving a sense of the place or object, then textured meshes are vastly superior. If the intent is a survey quality representation with the ability to perform measurements within some reliable error tolerance, then laser scanning is the clear choice. The alternative of course is to deploy both techniques as occurred for the recording of the rock shelters, one of which was presented as an example.